90 minutes to better service: We offer 90-minute, lunch 'n learn networking sessions to share referrals and agency information, and to provide an update or overview on a various topics of specific interest to human service professionals. 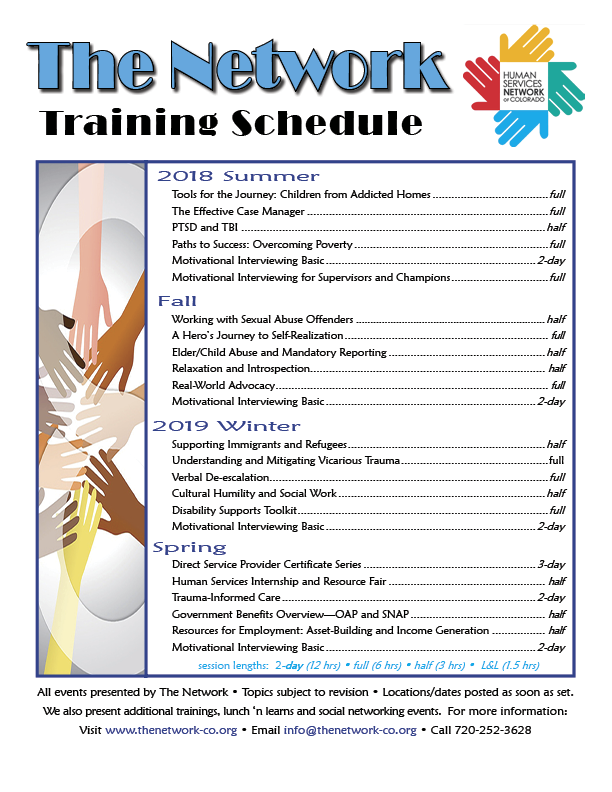 Training events: The Network hosts half and full day training in core competencies for human services. All training events offer continuing education credits. Find out more or register by visiting our interactive event calendar. Networking events: We offer social events several times a year. Free to all, these events provide an opportunity to share resources and information with peers. Find out more or register by visiting our interactive event calendar. Have a trainer or presenter you'd like to recommend? Want to join our training team to help us plan future events? Contact info@thenetwork-co.org.